Facebook Live is certainly the leader among live video broadcast apps.Until recently, the only way to live stream to Facebook was via the Facebook app. But you may now broadcast live to Facebook from your desktop or laptop computer with the creation of new third-party tools. It’s great fun and the learning curve is not that challenging. You need to follow the bellow steps to do that. First of all you need to download a software name OBS Studio which is available for free, on macOS, Windows, and Linux. There is a older OBS Classic but remember you need to download the latest version. The Classic version doesn’t have support for Facebook Live. You can launch the OBS software once you have it installed. A Facebook Page that you manage. Simply click the button below that says Create live stream to Facebook . After that you’ve got choices of where you want your stream to appear. You may select a friends’ timeline, a group you belong to, from your personal timeline or a page that you manage. Now you have to be careful to the fields titled Server URL and Stream Key. To configure your stream in OBS these are essential. Leave this window open. Now you need to go back to OBS. After that you need to click SETTINGS in the bottom right corner. After clicked you will show a panel. You need to click the STREAM icon on the left side. Now select Custom Streaming Server from the pulldown menu. Now you need to remember the Server URL and Stream Key. You can save it by coping it anywhere. After that click the Use authentication checkbox. Here you need to enter your Facebook username and password. Click Save and you are almost there. After that click Start Streaming in the bottom right corner of OBS. You should see an image from your webcam in the Facebook window where we discovered the Server URL and Stream Key after OBS will now talk to Facebook. You are almost done. It’s time to enter text for the post which will accompany your Facebook Live video stream. You can add a title for your video and can type in some video tags too. Now finally click GO LIVE in the bottom right corner of this window. 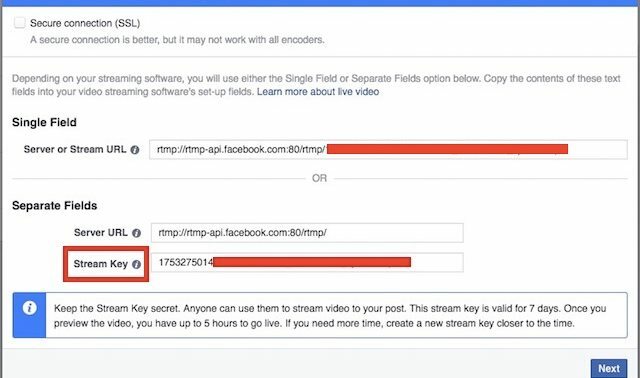 Pull up the page where your video is set to broadcast on Facebook to confirm that you are live. Now you just need to wait for few seconds. Now you are broadcasting LIVE on Facebook from your computer webcam! If you like the trick then comment us. Stay with us to get more.